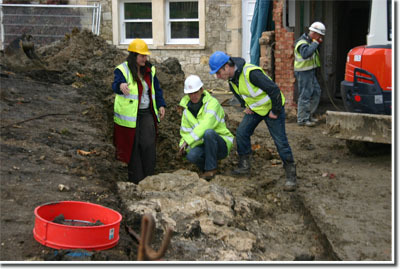 MA Ltd. archaeologists made an exciting discovery whilst working at West Cowes Castle during the winter of 2010/2011. During excavations required for an extension to the Royal Yacht Squadron building behind the original fort, sections of wall that were probably part of the original Tudor structure were discovered alongside the present driveway. Two sections of wall were uncovered during the work. Further research identified a 1576 survey and plan of the fort which, when overlaid with modern plans, revealed that the wall is almost certainly part of the retaining wall of the dry ditch that protected the back of the castle, and was probably contemporary with the fort’s construction (from 1539-1542). The ditch ran along the entire length of the back of the castle and was approximately four metres wide. The recent excavations showed that the retaining wall, which kept the ditch from collapsing, was 2.7 metres wide at the top but may have been even wider and higher in its original state. Over 400 artefacts were recovered during the dig – mainly ceramics, oyster shells, tiles, animal bone and clay pipes. The pipes were dated to the late 17th century, and may be contemporary with repair work that historical records suggest may have taken place in the early 1600s. Further analysis is ongoing. Cowes Castle was part of King Henry VIII’s massive fortification programme of the 1540s. The ditch was designed to defend the castle in the event of French forces landing elsewhere on the Isle and attacking from behind. When the castle became obsolete in the 18th century, the ditch was turned into a garden and subsequently all traces of it were lost. After discussions with the Isle of Wight Planning Archaeologist, the Royal Yacht Squadron and the architects, the remains of the wall were protected and re-turfed, and the plans for the new driveway were amended to incorporate the features. The finds recovered from the site will be archived with the Isle of Wight County Museum.